FOUNTAIN VALLEY, Calif. (Oct. 2018) – Bend, Oregon-based Sunshine Retirement Living, a family-owned senior housing company with 21 retirement communities in 10 states, will soon break ground on a premier, resort-style assisted living and memory care community in Fountain Valley, California. Located at 11360 Warner Avenue and adjacent to Fountain Valley Regional Hospital and Medical Center, Park View Estates will encompass more than 100,000 square feet on 3.5 acres with 145 state-of-the art suites amongst beautiful grounds and courtyards. When construction is complete in the first quarter of 2020, Park View Estates will provide all-inclusive living and world-class personal care in a warm, welcoming and secure environment where residents are encouraged to feel independent, safe and engaged. Both memory care and assisted living residents will enjoy numerous services and amenities at Park View Estates, such as a delicious, nutritious and extensive dining program, and access to the beautiful courtyards with walking paths, gardens and fountains. The community will also feature a wellness/fitness center, library, computer room, chapel, formal and casual dining rooms, arts studio, reserved parking, theater, and beauty salon/barber shop. The Memory Care Neighborhood at Park View Estates, which includes 44 shared and studio suites located on the first floor, will offer comprehensive, advanced and integrated care services and amenities, which medical research has shown to benefit people with dementia, Alzheimer’s and other memory-related diseases. Personalized care and social programs are offered for all stages of memory loss, such as a Life Enrichment program to encourage residents to participate in active daily living activities that encourage self-sufficiency and help stimulate past memories, and a solace program for end stages of the disease. Memory Care residents will also benefit from an innovative, 24/7 dining experience featuring meals recommended by Rush University Medical Center in Chicago and the MIND Diet Program, which may reduce the risk of developing Alzheimer’s by as much as 53 percent, and help maintain cognitive function equivalent to a person seven and a half years younger. Additional services high-tech safety systems to ensure resident safety, indoor and outdoor life skills stations, Wala lighting to promote Circadian Rhythm wellness, and secure outdoor courtyards with sensory garden to encourage outdoor exercise. The Assisted Living Neighborhood at Park View Estates will be located on both the first and second floors with 106, beautifully designed studios, and one- and two-bedroom apartments. Assisted living residents will receive personalized and customizable care and wellness programs, including: personal hygiene and grooming, dressing and clothes selection, showering and bathing assistance, meal assistance, incontinence management, mobility support, socialization and medication assistance. Residents will also enjoy weekly physical and intellectual activities, such as language classes, board games, crafting, happy hours, and music, aromatherapy and pet therapy sessions, and more. 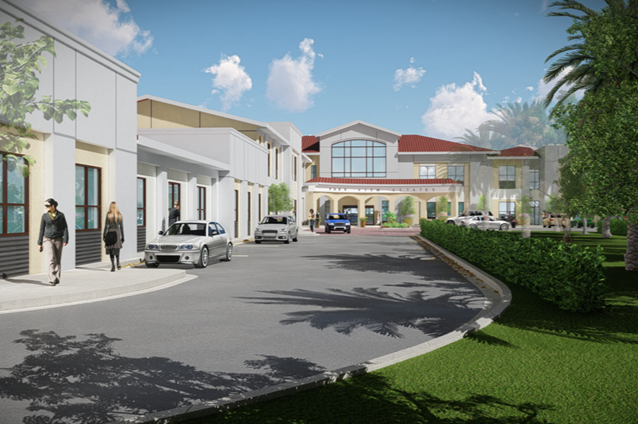 Both the Memory Care and Assisted Living areas, teams of caring and highly skilled care professionals will include licensed nurses on staff 24 hours each day, an experienced move-in coordinator to manage challenging transitions, and a knowledgeable concierge that is available seven days each week. Designed in the classic “Spanish Colonial Revival” with character and charm, the architecture of Park View Estates will create a warm and inviting, non-institutional character to enhance the quality of life of its residents. The architectural style is a hybrid based on the architecture found during the early Spanish colonization of North and South Americas. It started in California and Florida, which had the ideal climate for Mediterranean-inspired architecture, and remains popular today. With Spanish Revival architecture, new features were added to classic ones to create a distinct look of architecture common to Southern California. Details and features including reddish clay-like roof tiles and stucco exterior walls will provide a warm, earthy, and attractive look. A graceful curved archway common to the Spanish Colonial style will welcome residents and guests at the front entry, while the community’s courtyards and patios encourage outdoor living in the mild climate of the Southern California. “Park View Estates is an excellent example of understanding the values, desires and expectations of newer generations of seniors and their families,” said Glenn Decker, Architect and Development Director, Lantz-Boggio Architects & Interior Designers of Englewood, Colorado, the firm behind the community’s design. For more information, visit ParkViewRet.com.